Health & BeautySwanson AjiPure L-Tryptophan TryptoPure 500mg - 90 kaps. 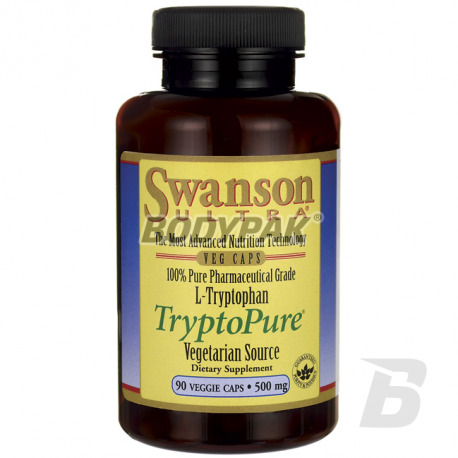 Swanson AjiPure L-Tryptophan TryptoPure 500mg - 90 kaps. L-Tryptophan is a natural antidepressant, increases the level of serotonin, which reduced the level is the primary cause of anxiety and depression, changes in mood and behavior, sleep disorders and tendency to addiction and overeating. 222 loyalty points Your cart will total 222 points that can be converted into a voucher of 8,88 PLN. L-Tryptophan - is an exogenous amino acid included in the proteins which must be delivered into the body with food. The brain uses the L-tryptophan for the production of the neurotransmitter serotonin needed to carry nerve impulses from one nerve cell to another. Lack of serotonin causes depression, insomnia and other mental disorders. L-tryptophan relieves stress, is soothing for your heart. Effectively suppresses appetite allowing adjustment of weight. It affects the good, deep sleep, which is essential for proper recovery time. Accept single servings 1 once a day on an empty stomach. Accept one 1raz servings per day on an empty stomach. Swanson Inosine 500mg - 60 kaps. High-grade L-tyrosine in the form of a powder. Highest quality and ease of supplementation! It has broad activity and can be used as a stimulant and improving concentration. Improve your well-being! Swanson Berberine 400mg - 60 kaps. Are you worried about your blood sugar level? Reach for berberine, which will help you to regulate it. Each serving delivers as much as 400mg of berberine hydrochloride obtained from Berberis aristata! The highest quality guaranteed by the manufacturer! Olimp Gold Ashwahandha - 30 kaps.